Edwin Hawley Dyer. Image available on the Internet and included in accordance with Title 17 U.S.C. Section 107. Houston Buffalos Logo, Houston club of the Texas League. Image available on the Internet and included in accordance with Title 17 U.S.C. Section 107. DYER, EDWIN HAWLEY (1900–1964). Edwin Hawley Dyer, baseball player and manager, son of Joseph Dyer, was born in Morgan City, Louisiana, on October 11, 1900. After attending public schools there, he enrolled in Rice Institute, Houston, where he played football and baseball. He was a member of the class of 1924 but did not graduate until 1936, after playing with various minor-league baseball teams. 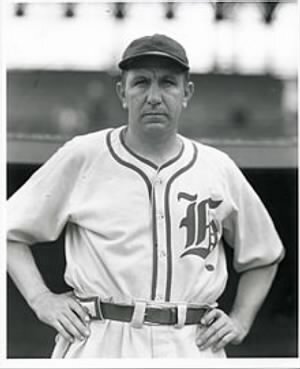 As manager of the Houston club of the Texas League he won league championships in 1939, 1940, and 1941, and in 1942 he was named minor-league manager of the year for his direction of the Columbus, Ohio, team. Thereafter, he joined the St. Louis Cardinals and was manager of that club when it won the World Series in 1946 by beating the Boston Red Sox four games to three. After twenty-three years as a player, manager, and coach, Dyer moved to Houston in 1948 and opened an insurance office. He relinquished managership of the Cardinals in 1950. On January 2, 1962, he suffered a stroke and on April 20, 1964, died of a heart attack. His survivors were his wife, the former Geraldine Jennings of Timpson, a son, and a daughter. Dyer was buried at the Garden of Gethsemane in Houston. He was described in the Official Encyclopedia of Baseball as a "slow-speaking and quick-thinking Texan" and was considered one of the best teachers and developers of young baseball talent. He discovered such men as Stan Musial, Howard Pollet, and Jeffre Cross. Pollet and Cross were associated with him in his Houston business. Houston Post, April 21, 22, 23, 1964. Newsweek, May 4, 1964. New York Times, April 21, 1964. Official Encyclopedia of Baseball, 1956. Handbook of Texas Online, Clay Bailey, "DYER, EDWIN HAWLEY," accessed April 23, 2019, http://www.tshaonline.org/handbook/online/articles/fdy02.